Digital Blood Pressure Monitor - Dr Morepen BP - 04i 90 Sets Of Memory Automatic Power Off -Low Battery Indication Easy One- Touch Operation Average of last 3 readings The Dr. Morepen BP04i Blood Pressure Monitor is a wonderful medical device that makes keeping track of your blood pressure levels a convenient task. It is ideal for people with blood pressure or in clinical settings by healthcare professionals as an aid to examine the fluctuations in blood pressure. Its exclusive features and affordable price make it an indispensable one. Sporting easy, one-touch operation, low battery indication and automatic power-off features, this blood pressure monitor is convenient to use. Its highlights include a large LCD display and a protective storage case. The precision of output is endorsed by its digital numerals that display the average of last three tests and have 90 different memory groups. 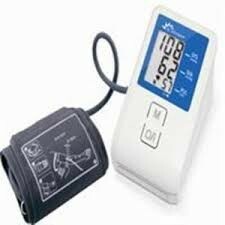 This blood pressure monitor is operated through a battery and comes with a one-year manufacturing warranty.